While enjoying some robata grill happiness at Yuzu, my favourite sushi and robata grill in Chicago’s West Town, the owner sat with my restaurant advisor and me so that we could catch up, having not seen each other since the New Year began. Afterwards, she walked us over to the first location where Yuzu first opened its doors for business for an introduction to the owners of the new restaurant that had moved in. My restaurant advisor and I only sampled a small dish called sai-krok e-sam. 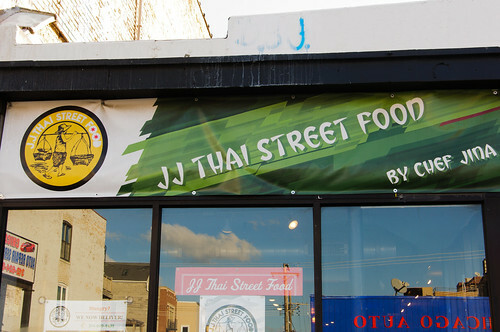 Two grilled Thai style pork and sour rice sausages were all we needed to return to JJ Thai Street Food at 1715 W. Chicago Avenue. Having perused the menu, we noticed that much of the usual Thai fare was not listed. There was no pad Thai, pad see-ew, red curry, green curry, yellow curry, or Thai fried rice dishes. And during conversation with the owner, who was not present when the owner of Yuzu had walked us over to make the first introduction, it was then known that the food was prepared truly culturally, with made-to-order customizations on request. This was a plus because it was apparent we’d have dishes cooked they way they are cooked in Thailand proper. Two menu items that we started with were gai satay, which were three skewers of chicken served with a creamy peanut sauce and a cucumber salad. Unlike gai satay at many Thai restaurants, the chicken breasts were substantial. And it took very little work to get the succulent chicken off of the skewers. 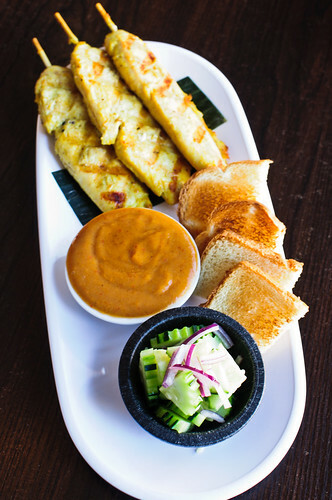 The dish also came with grilled toast that tasted like cake when dipped in the accompanying peanut sauce. The second item was a small platter of gyo tod, which were fried wonton stuffed with ground chicken. 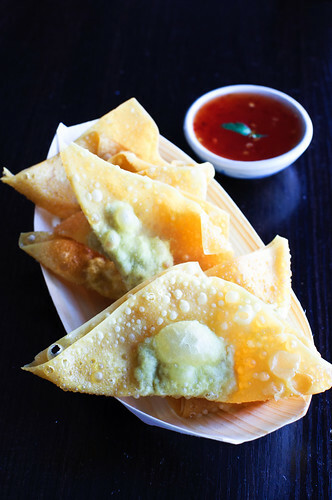 Served with a spicy sweet and sour sauce, I don’t think I will ever want crab rangoon after having these lovelies. Where it was evident that JJ Thai Street Food would make a consistent favorable impression on the palate was with the tom yum hung nam knon. This pot of soup had a spicy kick to it but without the highlighted sweetness one gets at a lot of Thai restaurants. The mushrooms were plump. There were no bell peppers, carrots, and onions. The shrimp was not popcorn shrimp. 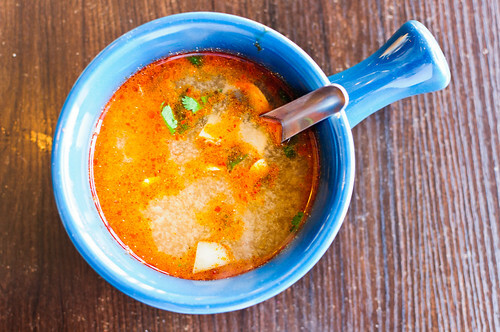 For the soup to have been minimalist with ingredients, it was aromatic to smell and divine to taste. Because my restaurant advisor and I had budgeted the whole afternoon for a sampling of multiple dishes, one main landing we ordered was khao khai ra berd ta lay. 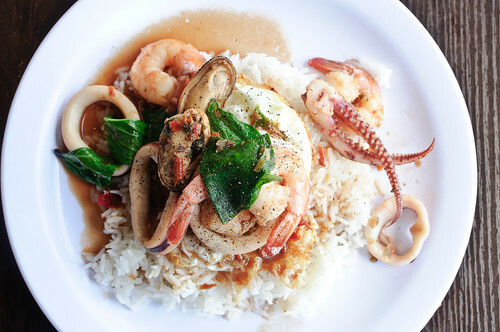 Not a dish one usually skims across on menus at Thai restaurants, this plate of stir-fried shrimp, squids, and mussels with basil over rice and topped with a sunny side up egg was simply heaven. The spices were welcoming enough without making the dish hard to enjoy, but perfect enough to wake senses. Our second main landing reminded me of a lamb panang dish I’ve had at Herb, which is my favourite fine dining Thai restaurant in Chicago. 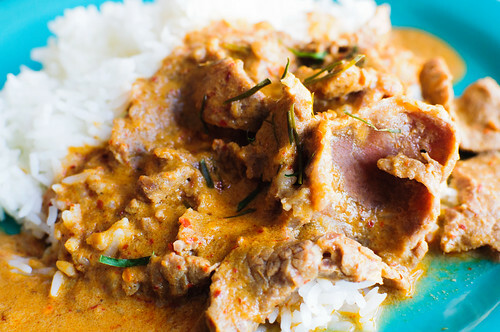 The khao panaeng neua was panang beef served over rice. Another minimalist dish, it came without the addition of a long list of ingredients, just a hearty gravy accented with a perfect amount of herbs and spices. 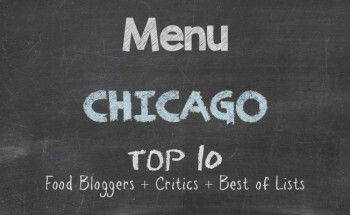 This was proof that very little can be a plus with preparing extremely enticing menu items. 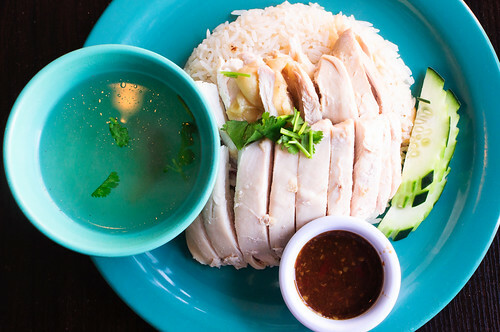 The final landing was khao mun gai, which was braised chicken served over ginger rice with a cup of chicken stock. Looking at the plate, one would think it had no flavor to it. The khao panaeng neua had already resulted in very little conversation between my restaurant advisor and me, but the khao mun gai had rendered us completely silent. This must be a surprise dish because for it to look tasteless, the seasoning of the chicken without being too much and the ginger rice made for an outstanding dish. Even with the accompanying spicy side sauce, there was a punch before adding it that made the dish addictive. 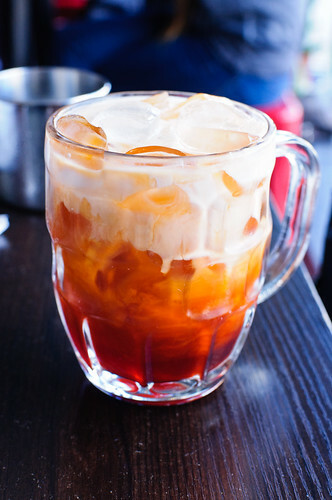 Chicago boasts a large number of Thai restaurants and while I have been to many that I love and frequent, JJ Thai Street Food is indeed the second Thai restaurant where I have developed an addiction. I recommend it highly. The service is impeccable. Being familiar with authentic Thai food and having a limited grasp of the Thai language, I had a bit of ease with ordering and asking for recommendations. But I am certain that the service would have been just as outstanding had I not switched in my limited Thai. As to the food, I cannot express how much I have become a fan. Everything is cooked once the order is placed, so nothing comes to the table immediately. Be glad because that means you’re getting a meal with fresh ingredients, not pre-packaged, not defrosted and microwaved, but prepared on the spot. 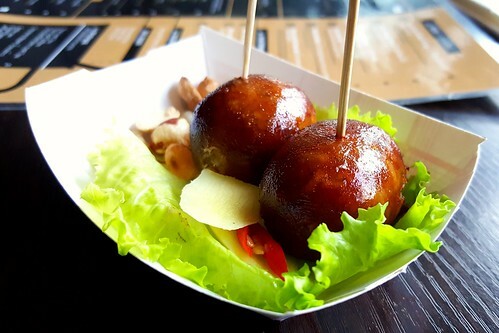 I’ll leave you with two phrases to use while at JJ Thai Street Food: aroy (delicious) and kab kun krub (thank you).